Kari Johansson, PhD student, Martin Neovius, postdoctoral research fellow, Ylva Trolle Lagerros, physician, Richard Harlid, physician, Stephan Rössner, professor, Fredrik Granath, statistican, Erik Hemmingsson, postdoctoral research fellow. : BMJ 2009;339:b4609 doi:10.1136/bmj.b4609. 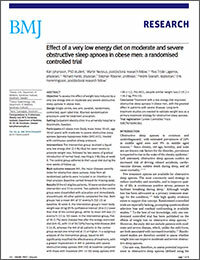 Effect of a very low energy diet on moderate and severe obstructive sleep apnoea in obese men: a randomised controlled trial.